For my birthday recently, my husband gave me a copper beating bowl. He knew how much I admired Monet's kitchen in Giverny and all the copper pots and bowls hanging on the wall there. In an odd bit of coincidence, my youngest daughter gave me a set of copper measuring spoons. The two had not discussed the copper focus at all. To try out my new bowl, I made this chiffon cake. It's based on an online recipe by Rachael Ray, but slightly altered. Mine turned out a wee bit underbaked at the recommended 55 minutes, so I've upped the recommended time to 60 minutes. It's a wonderfully light and airy cake and one I'll be making again. 1. Preheat oven to 325 degrees. Have a two-part tube pan ready for baking. No grease needed. 2. In a large bowl, combine the flour, 1/2 cup sugar, baking powder, salt, ginger, cinnamon, nutmeg, and cloves. 3. In another, smaller bowl, whisk the egg yolks until well blended and slightly paler. Whisk in the pumpkin puree. Add this mixture to the dry ingredients. 4. In a clean, grease-free bowl (I used my copper beating bowl), beat the egg whites until foamy. Add the remaining 1/2 cup of white sugar and continue beating until stiff but not dry. 5. Add 1/4 of the egg white mixture to the pumpkin mixture. Gently fold until almost no streaks remain. 6. Add the remainder of the egg whites to the bowl. Again, gently fold until no streaks remain. Pour carefully into the tube pan. 7. Bake for 60 minutes, or until a toothpick or piece of uncooked spaghetti inserted into the cake comes out clean. 8. Turn the cake pan upside down and suspend over a funnel or propped between two cans or glasses until completely cool. 9. Carefully run a knife or off-set spatula between the outside of the cake pan and the cake to loosen. Separate the cake pan, then run a knife around the bottom of the cake to loosen and turn out cake onto serving plate. 10. Make a runny glaze with icing sugar, soft butter, vanilla flavouring, and milk or cream. Drizzle over the cake top and sides. When I have opportunity to serve a group, I am going to try this recipe. It looks delicious, but I don't dare make it just for the four of us! The cake looks and sounds delicious. 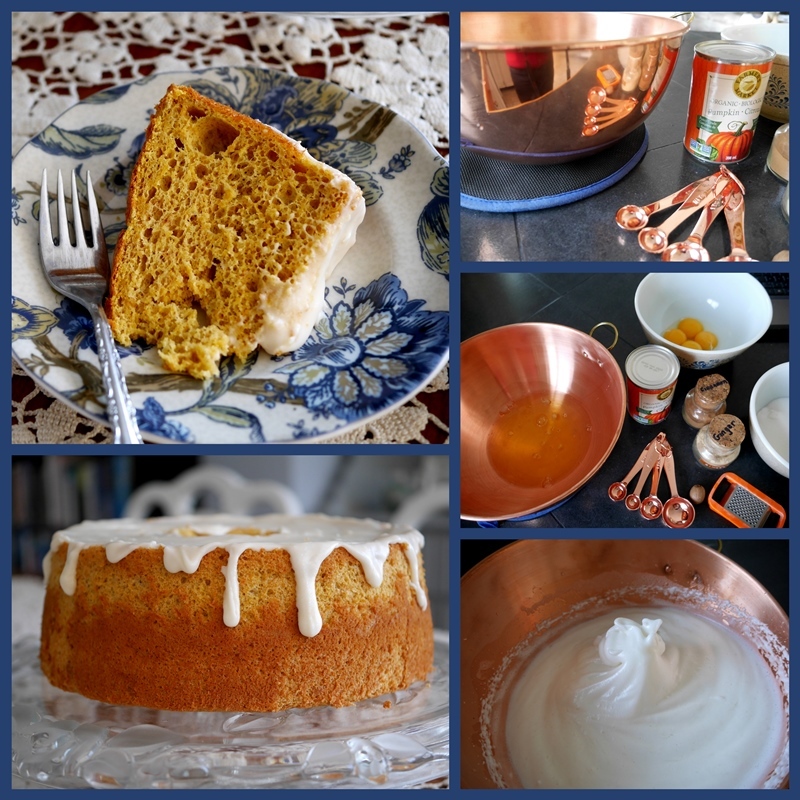 My only question is does the copper affect the taste of the cake at all? Have a lovely weekend ahead and thank you for stopping by my blog this week.